Postdoctoral fellow Daniel Fil, Ph.D., left, and Assistant Professor Mahmoud Kiaei, Ph.D., examine a sample from their project to create a mouse model to aid researchers in studying ALS. Feb. 14, 2017 | Feb. 14, 2017 | Researchers at the University of Arkansas for Medical Sciences (UAMS) have found a new way to replicate Lou Gehrig’s disease in mice, in what they hope will bring scientists one big step closer to a cure. Lou Gehrig’s disease, also called amyotrophic lateral sclerosis (ALS), attacks the nerve cells that control muscles, called motor neurons. Patients become progressively weaker, eventually losing the ability to speak, eat, move and breathe. There is no cure and the disease is 100 percent fatal. Death sometimes occurs as fast as six months to a year after diagnosis. 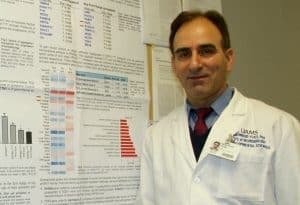 Mahmoud Kiaei, Ph.D., an assistant professor in the department of Pharmacology and Toxicology, has published his ALS mouse model in the journal Human Molecular Genetics. “Advances like this give me lots of hope and optimism that we will be able to discover a drug to treat ALS sooner,” Kiaei said. About 10 percent of ALS cases in the United States are inherited. In the mid-‘90s, after the identification of one gene associated with ALS, scientists first replicated human ALS in mice, creating a so-called “mouse model.” For many years, it remained the only mouse model available for ALS testing, but it failed to yield a drug treatment that was replicable in human clinical trials. In 2012 another gene mutation – Profilin 1 – was shown to cause ALS. With the publication of that discovery, researchers across the world worked to create a mouse model with the mutation. A little over a year later, researchers at UAMS and a lab at the University of Massachusetts were both successful, and Kiaei said the fact that two labs reached similar results gives him even more confidence that this will be a powerful model for use in ALS research. Because the model closely replicates ALS symptoms, researchers are able to get a better look at what is going on at the molecular level at each stage of the disease. “We will gain a greater understanding of neuron structure and how they get damaged by this faulty protein, how a tiny change in a single protein kills the neurons that control our muscles and, ultimately, how we can intervene to fix them,” Kiaei said. Kiaei and his team were able to create the mouse model by injecting the human faulty genetic material into fertilized mouse eggs. Successive generations of the mice passed the gene on to half of their offspring, as expected. Kiaei’s next steps will be to study the mice “inch-by-inch” to fully document the disease’s progression at a molecular level. 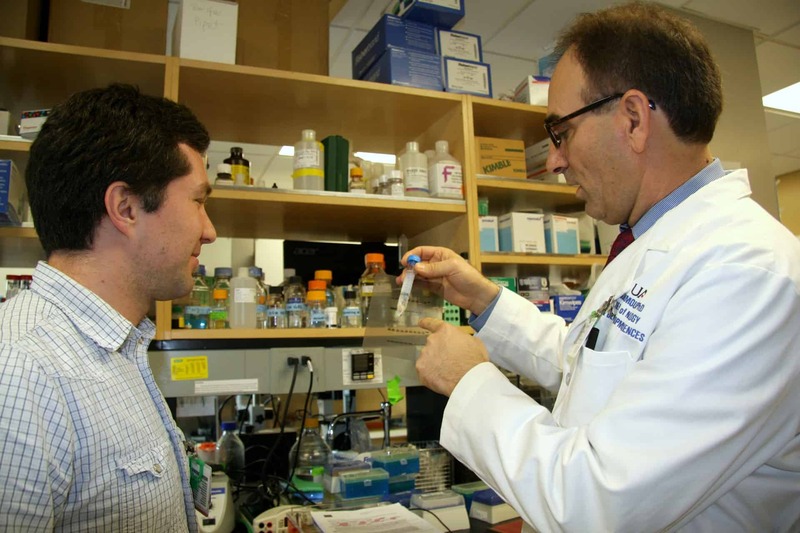 He hopes to show how exactly the genetic mutation causes ALS symptoms. And he expects that UAMS will be able to do its own drug testing on the mouse model. “We have that expertise right here on campus,” Kiaei said. In addition to providing quality medical treatments and advancing scientific research, part of UAMS’ mission is educating the scientific and medical minds of the future. Among the list of acknowledgements on the publication are multiple medical students and local high schools like Episcopal Collegiate School and Central Arkansas high school students that participated in ALS research. The J. Thomas May Center for ALS Research at UAMS is the only research center in Arkansas dedicated to finding a cure for ALS. It was established in 2008 with gifts in honor of May, who is former chairman and CEO of Simmons First National Corp. in Pine Bluff and a former University of Arkansas trustee. May was diagnosed with ALS in 2005 and is now chairman of the Simmons First Foundation. No funds from the research center were used for this particular project, but Kiaei said that Arkansans like May living with ALS continue to inspire him. Daniel Fil, Ph.D., a postdoctoral fellow in the Department of Pharmacology and Toxicology who is working on the project, said that he is looking forward to seeing what UAMS researchers and those at other labs are able to do with the mouse model, which over time will demonstrate if it is indeed as powerful as he and Kiaei hope. “It’s exciting because it’s really relevant to ALS that our model is so closely related to the actual disease in humans and might become a widespread tool for investigating the disease in ALS research,” Fil said. Kiaei earned his Ph.D. at the University of Otago in New Zealand. He worked at Weill Cornell Medical College at Cornell University in New York before coming to UAMS in 2011. In addition to the Department of Pharmacology and Toxicology, Kiaei has appointments in the Department of Neurology and Department of Geriatrics in the UAMS College of Medicine. Funding sources include the UAMS Startup Fund, Pepper Center Pilot Award, UAMS Center for Translational Neurosciences, National Institute of General Medical Sciences IDeA Program Award, the National Institute of Neurological Disorders and Stroke, the Les Turner ALS Foundation, the ALS Association, the ALS/FTD ALS Genetics Consortium, the National Institutes of Health, the ALS Therapy Alliance, the Angel Fund, Project ALS and the Michael J. Fox Foundation.